Homi Sethna, the guiding force behind India's first nuclear test in 1974, on Tuesday waded into the 1998 Pokhran row when he slammed former President A P J Abdul Kalam, suggesting he was no qualified authority to rubbish former DRDO scientist K Santhanam's claim that the explosion was not a full success. Simultaneously, another former chairman of the Atomic Energy Commission(AEC) P K Iyengar alleged that the 1998 tests were done in haste at the bidding of the government of the day. The BJP-led National Democratic Alliance government headed by Atal Behari Vajpayee had just assumed office when India conducted the tests. The comments by Sethna, who was the AEC chairman in 1974 and now in his eighties, came notwithstanding Prime Minister Manmohan Singh and missile man Kalam setting at rest the controversy over the 1998 nuclear tests. Kalam, who was Santhanam's boss as head of the Defence and Research Development Organisation in 1998, said only the thermonuclear device (hydrogen bomb) tested produced the 'desired yield'. 'What did he (Kalam) know about extracting, making explosive grade? He didn't know a thing. By being a President, he appeared to wear the stature. He relied on atomic energy to gain additional stature,' said Sethna about Kalam while talking to CNN-IBN. 'I don't like politicians -- especially lay politicians -- to interfere any more. I firmly believe that they should stay out. When we did the test, the first test there was no politician. It was a raw one. We were lucky that the whole thing collapsed,' said Sethna, who in his days in the atomic establishment had the reputation of being a blunt, plain speaking organisational leader. Kalam had on August 27 said Pokhran II was a success rubbishing Santhanam's claim that the tests were a 'fizzle'. Iyengar, who was among the three top atomic scientists who oversaw the 1974 tests, has already shared Santhanam's assessment of Pokhran-II and questioned official claims of success. 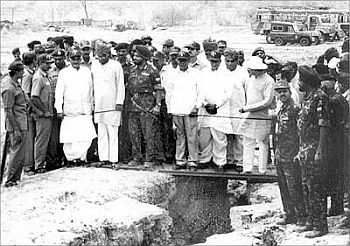 Iyengar suggested that in March 1998, two months before Pokhran-II, India's intelligence must have found out that the Pakistanis were about to test and that they were serious. 'Therefore, they (the new government in India) asked these people (scientists) to hurry up, do as fast as possible in all this extra pressure to be one up politically because BJP had just come to power,' he said. 'If Pakistan fired an explosion before India what a common man in India would have thought,' Iyengar added.